For designers and illustrators with an interest in print-making there is much to see in two inter-related exhibitions at the beautiful (if rather remote) Compton Verney gallery in Warwickshire, writes Clare Walters. The main exhibition, ‘Curious Beasts: Animal Prints from the British Museum’, shows print-making in a historical context as it displays 86 prints featuring animals from the mid-fifteenth century to the early nineteenth century. The range of techniques used is wide, including woodcut, engraving, etching and lithography, and many artists are represented, such as Albrecht Dürer, Rembrandt and Francisco de Goya. But there are also well known natural-history illustrators like John Payne and Wenceslaus Hollar, satirical cartoonists such as James Gillray, William Dent and George Cruikshank, and lesser-known and anonymous artists. 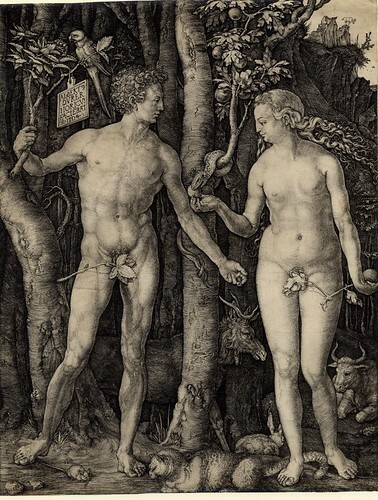 Dürer, Adam and Eve, 1504, surrounded by beasts and birds. 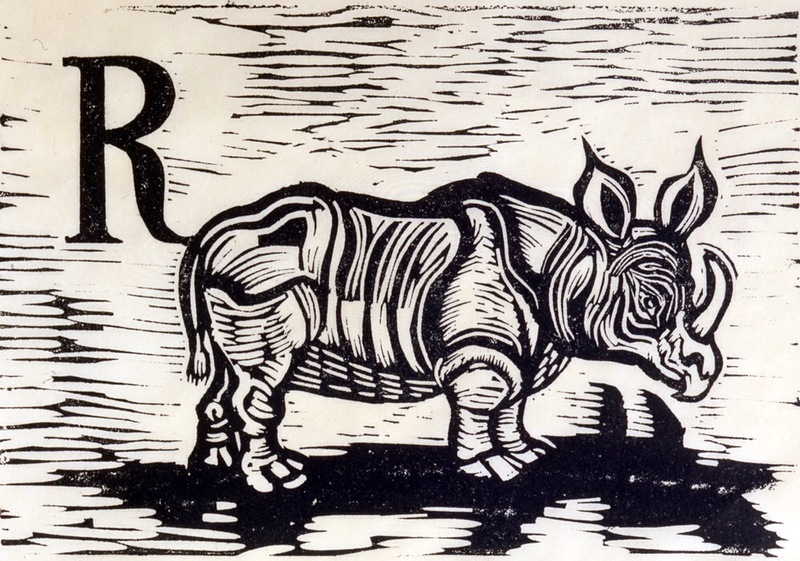 Top: Enid Marx, ‘R for Rhino’ from Marco’s Animal Alphabet, 1979. Memorable images include Dürer’s exquisite and highly detailed engraving Adam and Eve (1504), Dent’s hand-coloured etching The Return To The Political Ark (1790) and Cruikshank’s etching The Mermaid! 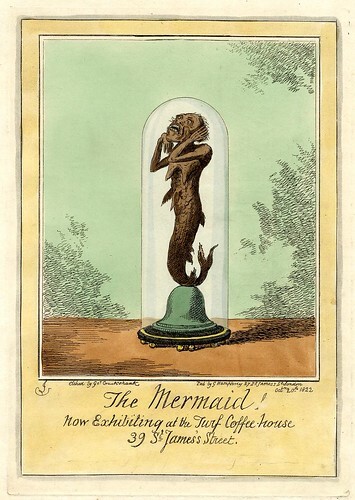 (1822) – an image of an alarmingly ugly creature purporting to be a ‘real’ mermaid that was exhibited in a nineteenth-century coffee-house. George Cruikshank, The Mermaid!, 1822. The second exhibition, ‘A Fantastical Animal Alphabet’, is more about current practice. This show displays 26 recent prints from nine artists based at the Leicester Print Workshop in the Midlands. 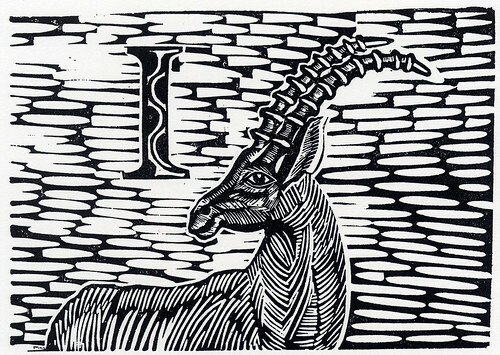 Here each print represents a different letter of the alphabet, illustrated by either a real or an imagined animal. As well as etching, additional print-making techniques are evident here, such as collagraph, silkscreen, linocut and letterpress. There is even a pop-up printers’ studio at the end. 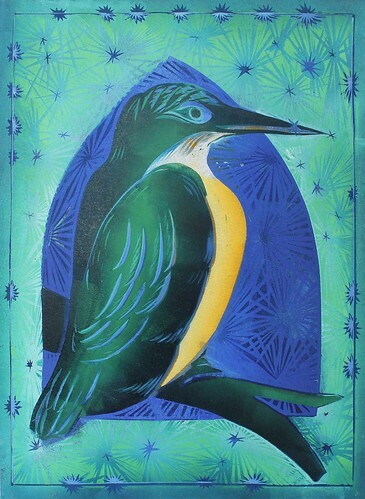 Sarah Kirby, K is for Kingfisher, 2013. Standout works from this second exhibition include Sarah Kirby’s K is for Kingfisher, a linocut print that has a deep richness of colour, and Alison D’Oyley’s witty Q is for Qwertysaurus – ‘a small lizard with markings resembling typewriter keys’ – influenced by Lewis Carroll’s Alice in Wonderland. 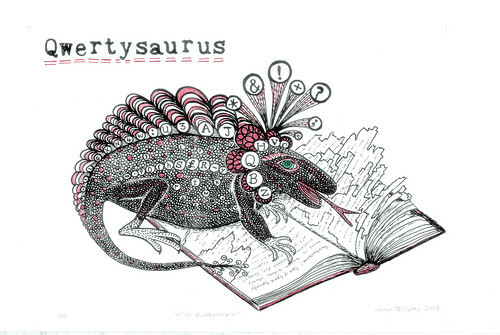 Alison D’Oyley, Q is for Qwertysaurus, 2013. These current artists took as their starting point Enid Marx’s children’s book Marco’s Animal Alphabet (1979), 23 prints of which are also on display in an adjacent room. Marx (1902-98) was contemporary of Eric Ravilious and Edward Bawden, and it is her twentieth-century prints that link the two exhibitions, as inspiration for the Leicester artists and as historical artefacts. 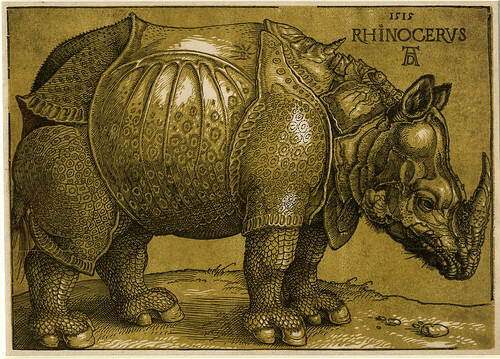 Albrecht Dürer, Rhinocerus, 1515, this impression after 1620. Many of Marx’s prints also echo the earlier works seen in ‘Curious Beasts’. For instance her ‘R for Rhino’ (top) references Albrecht Dürer’s imagined Rhinocerus (1515, above), while her ‘P for Porcupine’ recalls Frederick Hendrik Van Hove’s The Famous Porcupine – a beast that was on display in London in the seventeenth century. 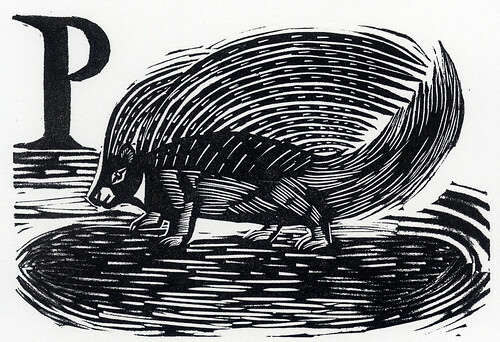 Enid Marx, ‘P for Porcupine’ from Marco’s Animal Alphabet, 1979. 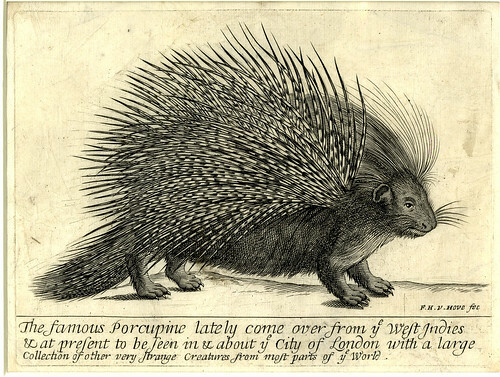 Frederick Hendrik Van Hove, The Famous Porcupine. Through growing urbanisation and population expansion (see the Sir David Attenborough debate), ordinary humans are become increasingly distanced from the natural world. But for centuries animals were at the centre of our universe. Imbued with moral, religious and symbolic significance, and admired as objects of curiosity and wonder, these creatures were seen as mirrors of humankind. And it is this human perspective that ultimately makes these two exhibitions so intriguing and memorable. 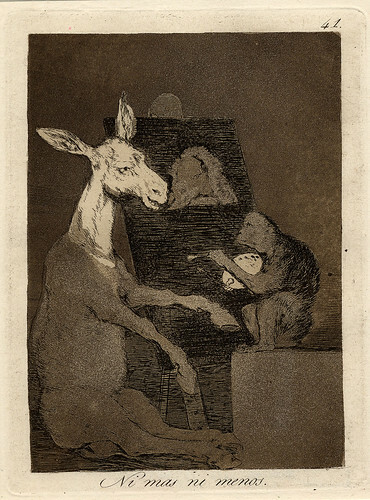 Francisco de Goya, Ni mas ni menos (Neither more nor less), 1799. One of a series of 80 satirical prints about human folly.